Cabinets & Granite Direct is an international importer of fine granite and cabinets. Operating for over nine years, they have grown from a single location to facilities in Cleveland, OH, Chicago, IL and two locations in Ontario Canada. Cabinets & Granite Direct purchased a Proliner 7CS in 2015. Wanting to keep up with technology in the digital measuring field, they felt the Proliner was the best way to fulfill their needs. Due to addition and changes in personnel, the Cleveland office recently invested in training for several of their employees at our Fort Pierce, FL office. After participating in a day of training and learning how to best utilize Proliner techniques, they were excited to take their knowledge back to Cleveland. Although the company has already increased production since owning the Proliner, all employees felt that the knowledge gained would enable even more opportunities to further increase production levels and decrease the time spend on the templating process. 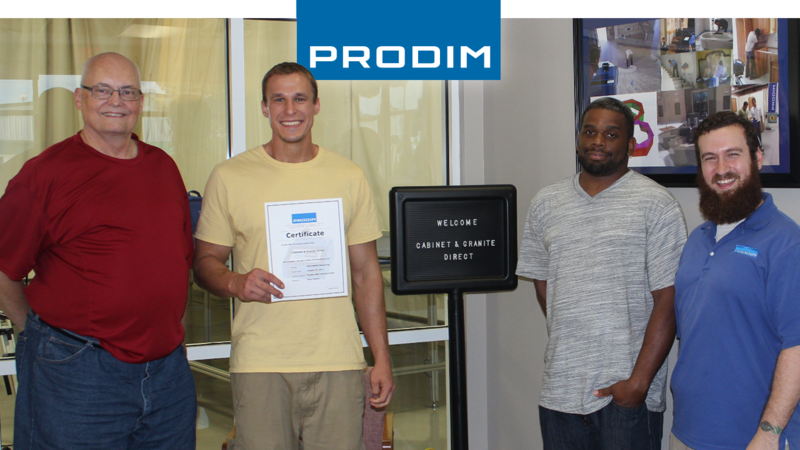 Cabinets & Granite Direct recognizes the value in employee knowledge and Prodim is always available to support training for both new and existing customers.